Corrosion inhibitors manufacturer Cortec has expanded its capabilities and efficiency with a new on-demand box-making machine. The machine will be used at Cortec Coated Products (CCP) in Eau Claire, located in the US state of Wisconsin. CCP manufactures Cortec’s line of non-toxic, recyclable VpCI papers that protect metal parts from corrosion during storage and shipment. With the new box machine, the plant will be able to make its own packing boxes and expand into active production of the VpCI CorrTainer boxes as well. Cortec claims to be first company to get an upgraded model of on-demand box-maker, which draws from six stacks of fanfold cardboard. 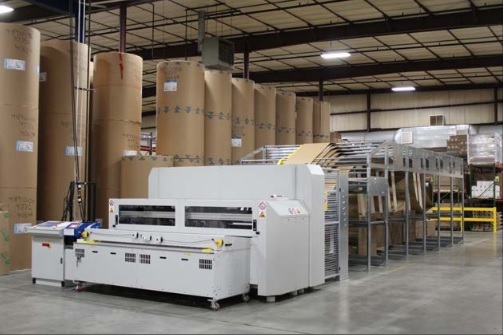 The machine can make cuts, scores and can glue the cardboard so that it can be folded into boxes of different shapes and sizes. The CCP has a touchscreen which allows for easy selection of box style and the required dimensions and can switch from one type of box to another with good flexibility and customisability. If a box is ripped accidentally during a 2000 odd box order, the operators at CCP can quickly replace and return to the main box run within a minute. It also claims that, as CCP starts making all of its own packing boxes, the site can also match boxes to custom order sizes for better fit and reduced waste. If an order is placed for custom-sized VpCI paper rolls, CCP will now be able to make the exact number and size of packing boxes needed. The company says that in the past, it was difficult to place a sample order for the corrosion inhibiting boxes, because the minimum order was a truckload. This made it difficult to supply one or two samples to customers interested in trying the box, but not ready to place an order. But now, the potential for making any number of the CorrTainer will open up the opportunity for samples and custom orders of this unique corrosion inhibiting box. Image: Cortec introduces an on-demand box-making machine. Photo: Courtesy of Cortec Corporation.